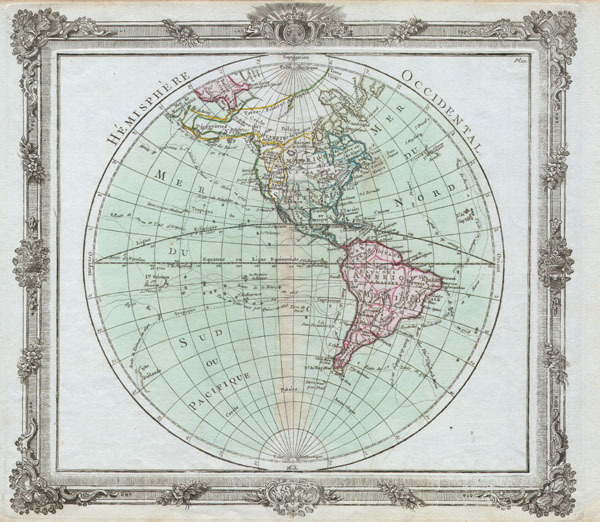 This is a rare and elegantly produced 1764 map of the Americas by French cartographer Louis Brion de la Tour. Depicts the whole of North and South America with several interesting cartographic features. The American northwest is largely ill defined though highly suggestive of the French conception of a water route through North America. The region of the Apache American Indian tribe is noted just north of 'Albion,' as are the lands of the Eskimos. In South America, some early colonial cities such as Cuzco and Lima are noted. The many different routes taken by important explorers are noted. There is a beautiful and elaborate decorative border. Unlike most maps from this series, the upper border is not cropped. Very Good condition. Minor color fading at centerfold. Blank on verso.